Barbara Rolek. The Spruce Eats, 2009. Croatian Easter bread dolls or primorski uskrsne bebe (literally "Easter babies from Primorje") are traditionally made in Primorje and Istria on the Adriatic Coast from pinca. They are prepared with a slightly sweet yeast dough braided around a colored hard-cooked egg, giving the appearance of a swaddled baby. In authentic versions, the eggs are dyed red, but more vibrant colors are creeping into the tradition. They look charming when laid on the table at each guest's place setting for Easter dinner. If you don't mind how the finished product looks, get the kids involved. 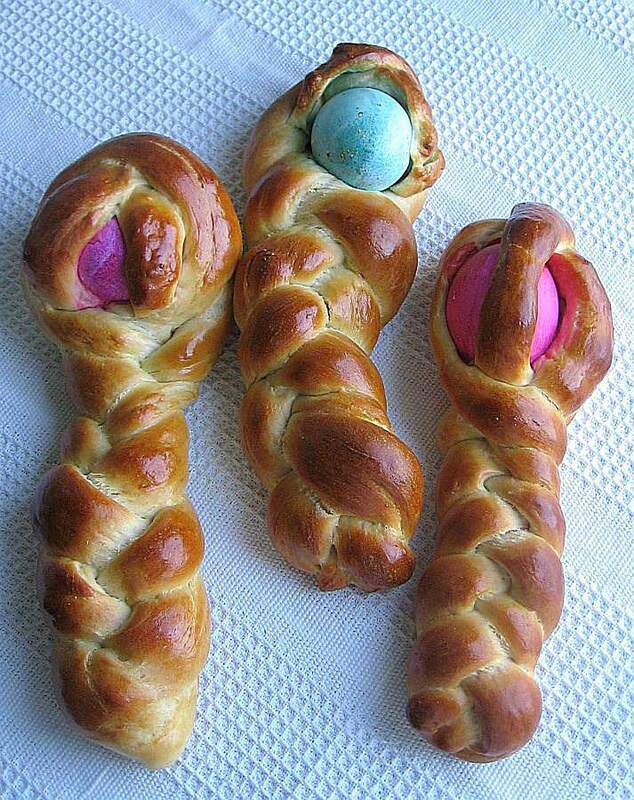 They'll love coloring the eggs, rolling the dough and braiding it. Scald 2 cups milk and cool to lukewarm (no hotter than 110 to 115 F). Add 1 package (2 1/4 teaspoons) active dry yeast and set aside. Meanwhile, in a large bowl or stand mixer, combine 2 large room-temperature eggs, 1/2 cup sugar, 4 ounces softened butter, and 1 teaspoon salt, mixing well. Add the yeast-milk mixture from step 1 and 3 cups all-purpose flour, and beat well. Add remaining 3 cups all-purpose flour gradually until a smooth, soft dough forms. Note: you may not use all the flour or may require more. Place dough in a large greased bowl, turning to coat both sides, and let rise, covered, until doubled, about 1 hour. Punch down and turn out onto a lightly floured surface and knead 2 minutes. On a lightly floured surface, divide the dough into 36 equal pieces. An easy way to do this is to divide the dough into 3 pieces, then divide each into 3 pieces again, then divide each into 4 pieces. Cover and allow to rest 5 minutes. Using 3 pieces per doll, roll each piece into a 12-inch-long rope. Begin by aligning the 3 pieces side by side. Press the three pieces together at the top and place an egg on top, pushing down slightly. Begin by wrapping the two side ropes around the egg as you would a scarp. Braid the remainder of the three ropes, below the egg, and pinch the bottom ends together and flip them under. Place doll on a parchment-lined baking sheet. Continue with remainder of dough balls. Cover with greased plastic wrap and let rise slightly. Egg wash the dolls with 1 large room-temperature egg beaten with 1 tablespoon water. The hard-cooked egg tastes just fine after being baked. The yolk might have a green sulfur ring around it, but that doesn't affect the taste.